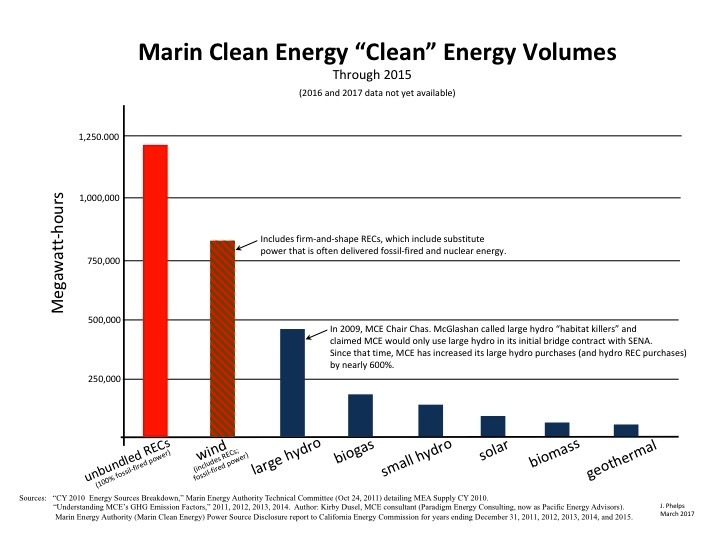 Marin Clean Energy is sitting on a mountain of cash that continues to grow. The cash doesn’t belong to MCE, a not-for-profit government agency, it belongs to its ratepayers. MCE has no plans of returning it. Payment of customers’ monthly exit fees that are levied by PG&E. This broken commitment amounts to more than $100 million that MCE did not honor. MCE has failed in serving the community, while it feathers its own nest. MCE now holds $37 million in cash and expects that to more than triple to $118 million by the end of its 2019/20 fiscal year. This behavior is more fitting of a private for-profit company that claims altruistic social objectives, then takes advantage of busy consumers who aren’t aware of what is happening. MCE’s cash accumulation has not been used to reduce prices, unless 6/100 of 1%below PG&E prices is considered low; nor has the cash been applied to the purchase and delivery of real clean energy to MCE’s customers during the past few years. To assuage onlookers’ potential objections, MCE claims the cash is needed for “working capital requirements.” However, as a percent of operations, MCE’s desired cash dwarfs its previous requirements, as identified in each generation of its several revised Implementation Plans. MCE also claims the cash is needed for “rate stability” and to “procure energy at competitive rates.” That is a reasonable suggestion, but it must be weighed against MCE’s record. It is just as reasonable to ask: How can MCE have banked $37 million in cash if it’s not already procuring energy at competitive rates? Amassing enormous sums of cash as a government agency, rather than returning it to its ratepayers. MCE got it “wrong” even before its business launch, when its leadership failed to prioritize its customers first, and instead favored its staff and consultants. MCE elicits a communal awareness of environmental sell-out each time it tells consumers that Shell is gone and that it has cleaned up its own oily mess, then surreptitiously cuts another million-dollar payment to Royal Dutch Shell for electricity purchases. Imagine the bait & switch uproar at MCE if, instead of receiving paychecks, staffers were suddenly given coupons that identified someone else, someplace else, had already completed similar work to what they completed and that, as a result, the coupon could be redeemed for pennies on the dollar. This is akin to what MCE does to the community each time it enters into a REC transaction. Consumers paid for clean energy, but MCE delivers fossil-loaded power (known as "Unspecified power," sourced through California's electric grid manager, CAISO). This arrogance extends to, and is underwritten by, MCE’s board. The cash hoarding occurs under its watch. Think the deviations won’t happen to your CCA board if you’re forewarned? The list of MCE’s bait & switch is exhaustive and illuminates the absence of integrity in community choice aggregation (CCA). It’s a problem that will only grow as CCA (aka community choice energy (CCE)) boards grow in number, as municipal representatives come aboard to take their representative positions on unwieldy large governing bodies. It’s a matter of conversion and indoctrination. Group-think boards are shaped by ambitious executives and shrewd consultants who hone their skills from experience and information-sharing with other consultants at other CCAs. The loss of critical and independent thinking by MCE’s board was evident when meeting with one of its board members in January 2015, after one year of his service on MCE’s board (see the comments at bottom of board member's post). When MCE’s green-washing activities with RECs was discussed, he denied what had happened and said, “That’s not my understanding of it.” Fair enough. Why hasn’t MCE spent its cash on clean energy deliveries to its customers over the past several years? MCE’s prices are 6/100 of 1% lower than PG&E prices. Why hasn’t MCE put its cash (ratepayers’ cash) into lowering its energy prices these last several years? Through 2015 -- five years of available data -- MCE’s energy portfolio emits an average of 43% more greenhouse gas (GHG) than PG&E’s energy, or 181 pounds more GHG per megawatt-hour, per anti-REC legislation AB 1110. According to MCE’s own filings with state regulators, one of its biggest “clean” electricity providers is New Mexico’s San Juan coal-fired power plant. San Juan’s power is cheap. Why are MCE’s prices high? MCE recently submitted a proposal to its Executive Committee on behalf of its CEO, Dawn Weisz. The compensation study called for adjusting Weisz’s annual salary to upwards of $332,062, putting her in the highest echelon of public service pay in California. Weisz came to MCE as a county planner with zero electricity experience. CCA executive pay is skewed by comparisons to CEO pay at other CCAs. These government agencies mirror and escalate one another's executive pay, creating a compensation bubble that is not based upon government energy agencies in California. Weisz is set to take a large sum from MCE’s coffers, along with her many consultants, lawyers, and wholesalers -- collectively known as "CLAW" -- who also feed at MCE’s trough. Some of MCE’s outside legal counsel collects more than $500 per hour. However, MCE’s money grab winner is Pacific Energy Advisors (PEA). After its help off-loading MCE liabilities, Weisz was indebted to share MCE’s wealth. MCE’s combined payments to PEA's two main principals since MCE launch, including the late arrival of a third person at PEA, is $4 million through March 2018. When MCE launched into business in 2010, it committed to pay all customers’ exit fees levied by PG&E. PG&E’s fee is known as “PCIA,” or Power Charge Indifference Adjustment. PCIA covers long-term energy contract obligations that PG&E assumed before MCE switched consumers from PG&E into its program, via its Opt Out mechanism. Weisz made presentations throughout Marin before MCE’s launch, and in the months afterward. MCE would provide each customer with an "energy credit" on their monthly electricity bill as full reimbursement of PG&E’s exit fees. The credit would show as a deduction on each customer’s monthly electricity bill from PG&E (PG&E includes MCE’s charge for “Generation” on its monthly electricity bills). PG&E’s exit fee currently amounts to about 3.5¢ per kilowatt-hour, almost $18 per month for a typical MCE home. Dawn Weisz’s titanic problem – who to blame? But there was a problem. A big financial problem. The energy credits calculated by MCE weren’t coinciding with the exit fees charged by PG&E. There was a $2 million-plus shortfall in the first year alone. Weisz was alarmed. MCE’s ballooning liability, which would ultimately prove to be $48 million over its first five years of operations, could torpedo her ship, along with the salaries and fees that MCE staff and consultants garnered each month from her agency. But Weisz had a plan, and she engaged her chief consultant, John Dalessi, in its execution. Nine months after its business launch, MCE announced a 14% price reduction. The news captured headlines of Marin’s primary media outlet, the Marin Independent Journal (IJ). Weisz touted MCE’s “superior product,” while Dalessi claimed the price cut would bring MCE prices into parity with PG&E. As part of its 14% price slash, MCE quietly cancelled its energy credit. The cancellation instantly shifted hundreds of millions of dollars of MCE’s long-term liability onto its customers. The 14% deal was complex and beyond the focus of Marin’s busy consumers. MCE's price cuts weren't uniform through its five price tiers. Furthermore, each residence’s energy use was different each month. Quantification of savings was next to impossible. Nevertheless, a 14% price-cut was a good deal, right? Consumers, unable to decipher what they were getting in the deal, did what they always did -- glanced at the multitude of line item charges on their monthly PG&E bill, cursed, and paid the amount due. Average ratepayers realized an 18% increase in their total electricity costs. High-electricity-use residences benefitted the most, realizing about 4% savings after also paying the exit fees that MCE had off-loaded onto them. Ultimately, any savings that consumers realized vanished with MCE’s next price increase. Weisz was privately exuberant. She had achieved the tantamount of a bloodless coup right under her customers’ noses. Successfully off-loading MCE’s ever-growing, monster-sized exit fee liability onto her ratepayers was a watershed event that signaled revitalized life for her new career. Life was better than good. Dalessi’s recommendation to MCE’s board, which was reviewed by MCE’s CEO, Weisz, said that MCE’s energy credit was being eliminated “in the interest of rate simplification and in anticipation of the reduction in PG&E’s exit fees – its power charge indifference adjustment” (emphasis added). The red herring was lost on MCE’s board, which lacked financial acumen. There was no rate simplification. Rates remained as convoluted as before, through five tiered price levels. If Weisz and Dalessi “anticipated” a reduction in PG&E’s exit fees (a reduction in MCE’s corresponding energy credit liability), why, after only nine months of operation, would they suddenly recommend that MCE cancel payment of its energy credit? Wasn't this a cornerstone of what MCE sold to consumers? After all, Weisz and her consultant were regularly tracking PG&E’s exit fees – they effectively had CPUC regulators on their speed-dial -- everything was on the up-and-up, wasn’t it? Shortly after MCE’s “14% price reduction" was implemented PG&E’s exit fees increased 3.3%. Through 2015, MCE’s ratepayers were left holding more than $112 million of costs that MCE had previously committed to pay in the form of its monthly energy credit. MCE is a government agency that is supposed to be a not-for-profit. To date, Weisz ignores inquiries about returning its cash to MCE’s ratepayers. Opt Out of MCE at (888) 632-3674. You will need your PG&E bill in hand to refer to your account number. You may also complain to your city council or, if you reside in an unincorporated area, County Supervisors. Engage an executive search firm for the replacement of MCE’s current CEO, Dawn Weisz. Redesign the board so that it is staffed with representatives who are not prone to group-think, and who have a skill set that is suitable for serving on the board of an energy reseller. LACCE Business Plan, dated June 30, 2016. Page 21, Exhibit 15, shows LACCE (aka Clean Power Alliance of Southern California) believes it can satisfy California's clean energy requirements with 100% Bucket 2 energy. However, California regulations limit Bucket 2 to a maximum of 25%. Marin Energy Authority Community Choice Aggregation Implementation Plan and Statement of Intent, January 2010: Retail Sales (MWh), p. 29, and Marin Clean Energy Summary of CCA Program Phase-In (January 2010 through December 2015), p. 43. PG&E Power Charge Indifference Adjustment Rates, updated 5/31/2016 by MCE. See also footnote 2. Part 1 in this series may be found here. Part 3 in this series will discuss (1) MCE’s public rejection of false green energy – renewable energy certificates (RECs) -- and its concurrent use of a front organization that lobbies for the continued use of RECs; and (2) MCE’s quid pro quo outreach where jobs are promised in exchange for favorable public relations in its coming fight with legislators and utility companies. Jim Phelps is retired after serving the power, petrochemical, and geothermal industries for nearly 35 years as a power contractor and utility rate analyst. He is not now, nor has he ever been, employed by PG&E. He has not received any money from PG&E for his work tracking Community Choice Aggregation and Community Choice Energy activities. He has also completed consulting and thermal performance test work for Shell Oil at one of its Gulf Coast refineries. Shell is formerly MCE's full-services energy manager and currently one of its regular energy providers. Among the former power company clients of Mr. Phelps' are Pacific Corp, Utah & Power Light, Kansas Power & Light, Duke Power Company, Cincinnati Gas & Electric, Pacific Gas & Electric, and Carolina Power & Light. Mr. Phelps operates one of Marin's largest residential solar electric systems at his home in Novato. Several years ago he initiated contact with PG&E about its carbon emission practices and also with MCE about its emission practices. He requested clarification from MCE and other CCAs about several business conduct issues, however, those CCAs declined to provide answers. To this time, MCE's only input about its business is to ignore Public Records Act requests, to identify the costs for copies of public documents, or to deny the existence of basic information, such as invoices detailing its procured volumes of system power (fossil energy).